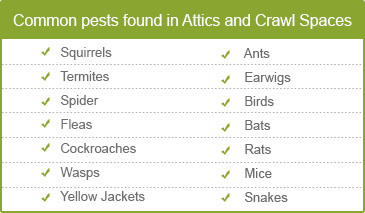 The attic and crawl spaces are usually forgotten as we don’t tend to live in there! Their importance is often undermined. But do you know that by paying a little attention to these functional spaces you can safeguard and protect your property and health big time. Regular inspection and evaluation of the attic and crawl space provides vital clues of the problems breeding in these damp and dark areas. Getting rid of them as early as possible not only controls the extent of damage but also helps you save huge bucks. We, at Quartz Solutions, are indeed the perfect answer to all your attic and crawl space woes. Skilled men well versed with latest technologies in the business, we promise to infuse life into your shattered and wrecked property. Most of us are unaware of the numerous dangers that constantly lurk in our attic and crawl spaces. Slowly but surely these infestations creep into our living areas, ruining our property and health completely. Damp and humid conditions are perfect breeding grounds for mold, fungus, and mildew. They rot wood and their harmful spores impair air quality fueling serious breathing disorders. Prolonged exposure to dampness weakens foundation walls, tear down wooden floors and trigger structural damage. Animals like bats mice, rodents, squirrels and raccoons move about damaging wires and cables. They leave behind a smelly clutter that triggers a slew of diseases. Pests and termites thrive in a damp conditions and cause severe wood rot besides spreading a range of diseases. Faulty and damaged ducts impair the insulation capacity of the property. This makes the living areas uncomfortable and inflates utility bills. Getting the attic and crawl spaces inspected regularly by professionals is imperative for keeping your premises comfortable, clean and hygienic. We, at Quartz Solutions, are proficient and well-versed with the latest techniques in the business. During the preliminary inspection our team will visit your property to conduct a thorough analysis totally free of charge. We will check the area for leaking gases, broken ducts and presence of other infestations and invasions. Once we have a clear a picture of the condition, we will lay forth a cost-effective plan to eradicate them in the least possible time. At Quartz Solutions we strive to provide high-quality services, expert consultation and support advice at the most competitive rates with no hidden costs. Old Tappan is a small borough in Bergen County, NJ. Spread over a total area of 4.197 square miles, the municipality has a total population of nearly 6,000 people. Touted as a great place to reside, work and visit; the borough has big parks, golf courses and recreational centers. Barring its name, Old Tappan has everything that is fresh and rejuvenating. We at Quartz Solutions too wish to make a small contribution to this municipality. 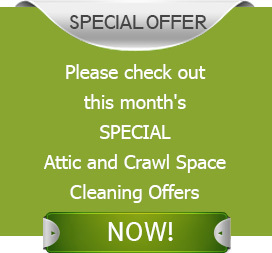 Let us be your obvious choice for helping you keep your attic and crawl spaces clean and functional. Call us at 201-205-2042 and schedule your complimentary attic and crawl space inspection, now!